You can manage to improve the quality of sleeping by getting a pair of comfortable noise-cancelling earmuffs. Just read this guide and find the same amount of relief as I did. I consider myself lucky for being able to afford a downtown apartment, in a building next to a very busy street. I love living in a sprawling, crowded area, where everything is at a walking distance. However, the nights in my area are very noisy, and I would always end up tossing and turning all night long because of the horrible street noise. However, all that changed once I discovered the practicality of noise-cancelling ear muffs for sleeping. Whenever I put my earmuffs on before going to bed, I know that I’m going to wake up feeling well-rested, focused, and refreshed. I’m not a particularly light sleeper, but even my sleep can get interrupted by noise, as long as it’s loud enough. When these interruptions start happening, even if I manage to fall asleep after each one of them, I still end up feeling exhausted in the morning. From time to time, I used to even suffer nightmares because of my disrupted sleep pattern. My entire nights would feel like fever dreams because of the endless annoying sounds of vehicles and loud passersby. I was more than surprised to find out that all I needed to deal with this problem was a pair of earmuffs for sleeping. I wrote this guide to share my experience with others because I managed to make a great improvement to my quality of living simply by getting a pair of soundproof earmuffs. If anyone finds the same amount of relief through this guide as I did, it’s going to be worth my effort. Not all earmuffs are made exclusively for sleeping purposes. A lot of the time, for example, they are used by industrial workers to protect themselves from the noise of heavy machinery. Earmuffs for sleeping, of course, differ from such models in many significant ways. These types of muff models were designed specifically for the purpose of sleeping. What that means is that they primarily have to be comfortable enough to be worn in bed. Usually, they are either very thin and out-of-the-way or exceptionally soft and fluffy. On top of that, they still have to perform their main job perfectly, which is blocking out the noise. Some people like to use earplugs to block out noise while sleeping. In my opinion, a pair of high-quality earmuffs is a much better option than plugs because they feel more comfortable. Besides, it’s not easy to lose a pair of earmuffs, while plugs are small and impractical in that regard. Since earmuffs for sleeping are a comfort product, naturally, we want to get the most comfortable muffs we can find. An ideal pair of earmuffs is barely even felt – most of the time, you shouldn’t even be aware that you’re wearing them. Different designs of earmuffs bring you different levels of comfort. I personally prefer the slim models which stay out of the way. However, some bulky models have powerful noise-cancelling abilities, which is why they shouldn’t be ignored either. In my opinion, the noise-cancelling ability is the second most important feature to look for in sleep earmuffs. Now, earmuffs employ many different methods of blocking sound. Some achieve their results thanks to a relatively thin layer of soundproof fabric. Others involve large, carefully engineered muffs which block noise with their specific acoustic structure and heavier materials. Overall, I believe any perfect earmuffs would have to meet both of these criteria: comfort, as well as noise cancellation. Safety is another important thing to consider because some of the best earmuffs have the ability to completely shut off the noise. While that may be highly desirable in terms of getting a good sleep, it can also be dangerous. Using those may mean staying unaware of everything that is going on in the vicinity. That is something that should be taken into consideration when buying a pair of earmuffs. For example, I’m comfortable with complete noise cancellation due to the fact that I don’t live alone. However, there’s always the risk of missing a morning alarm due to earmuffs. Earmuffs for sleeping usually come with a headband. It is important to make sure the size of the headband fits your head. Otherwise, you might experience a number of problems. An oversized headband, for example, may cause the muffs to slide off during the night. Likewise, a headband that’s too tight may cause a headache. People who are sensitive to headbands may even opt for bandless earmuffs for sleeping. Finally, I’d like to point out the importance of having earmuffs with a proper airflow. 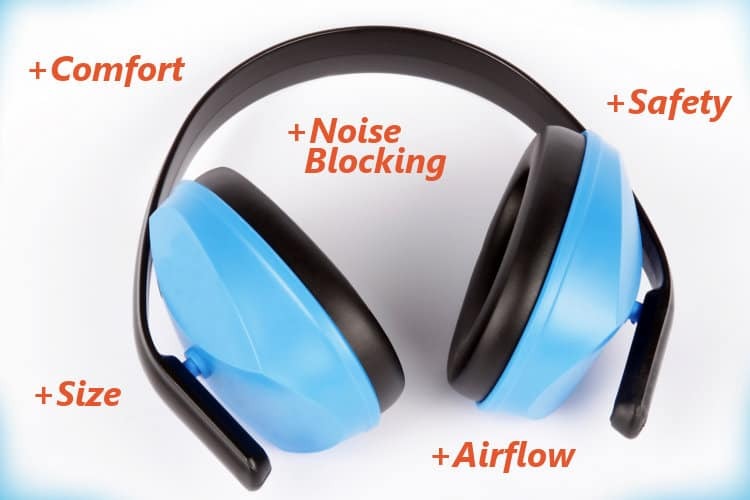 Namely, many noise-blocking products do their job by not allowing any sound to pass through. However, some modern earmuff designs will allow your skin to breathe while at the same time blocking out the noise. It truly pays off to keep an eye out for those. We’ve covered the essential features to look for when buying a pair of earmuffs. Now, let’s take a look at some of the best brands of earmuffs for sleeping. We’ll examine how they work and what sets them apart from the rest. The Hibermate Gen-6 is a luxurious, highly comfortable, practical set of earmuffs coupled with an eye mask. Hence, it is specifically made to serve as a sleeping aid. The Hibermate eye mask completely blocks out light, without allowing any to seep in from the sides. On top of that, the earmuffs are slim, compact, and cozy. They are made of silicone, thanks to which they are highly flexible and gentle against the skin. Their specific structure and design allow them to cancel out incredible amounts of noise. Although this set doesn’t block all noise for the sake of safety, sounds are muffled and no longer disruptive to sleep. One of my favorite features of Hibermate is how portable and compact this entire set is. In fact, it is surprisingly small, while still highly efficient. Besides, Hibermate is not disruptive to your sleep in the slightest. No matter which position you sleep in, you will barely be able to feel the muffs on your head. The outside of the muffs is covered in satin, which makes them very slippery against the pillow, so they stay on your head. All things considered, Hibermate is one of my favorite brands which makes a huge difference in your sleep quality. Wrap-a-Nap is an incredibly practical product which you can use in multiple ways. What we’re talking about is a large, soft, fluffy circle of fabric. First of all, you can wrap it around your head while covering your eyes and ears with it. That way, you end up with a high-quality sleeping mask and earmuff at the same time. If, however, you do not want to block your hearing and vision, you can simply wear it in other places. For instance, you can wrap it around your forehead or your neck. That way, you end up with something more similar to a standard travel pillow. The manufacturer of Wrap-a-Nap claims that this product can even serve as a pillow for lumbar support. In truth, this pillow really is an incredible sleeping accessory. It is easily adjustable to just about any width. Besides, it’s easy to carry around and is not only useful for sleeping in a bed. To truly experience the practicality of Wrap-a-Nap, take it with you on a long flight. The only downside to this earmuff is the fact that it can feel too warm, depending on the temperature of your room. However, it is very soft and comfortable. What this brand offers is a pair of sturdy and durable earmuffs which can block out an incredible amount of outside noise. At 34 dB, the efficacy of these earmuffs is incredible. Apart from that, they are relatively small, light and compact, which makes them easy to carry around. They are incredibly solid and hard to damage. It’s easy to notice that unlike the previous two entries on this list, this is a pair of ordinary earmuffs. You normally use such earmuffs to protect your ears during a firearms practice or while using heavy machinery. However, this specific model is different from most standard earmuffs in an important regard. Namely, the Pro For Sho is much thinner, lighter, smaller, and more comfortable than the great majority of similar models. That is why, for example, these earmuffs are usable by children and adults with noise sensitivity. I’m sure there are numerous other non-firearm-related ways of utilizing this product, and one of them is definitely sleeping. Just keep it in mind that these earmuffs will silence your world to an incredible degree. Just like the first two items in this list, this product is a sleep mask which also covers your ears. However, unlike the Hibermate, it comes as a single object rather than three separate parts. And, unlike the Wrap-a-Nap, the Sleep Master is slim and compact, rather than large and fluffy. Still, this mask/muff is very soft and comfortable, as well as durable, flexible, and adjustable. You adjust it with the help of simple velcro strips which are located in the back of the mask. The outer side is made of a synthetic material, whereas the inside is made of soft cotton. The cotton allows for phenomenal airflow. This mask is incredibly comfortable and it doesn’t slide off or move at all during the night. Likewise, it does not block out sound to a 100% degree, which means you’ll still be aware of your surroundings. If you do want to block sound completely, you can pair it up with some earplugs. What I also like about this mask is that it’s very easy to wash and maintain. That’s an important feature to consider in items you put on your face. Thanks to the comfortable shape, you won’t need to fear any headaches with this muff/mask hybrid. CozyPhones are somewhat similar to ordinary sleep headphones. However, what makes them better than those is the fact that they include a sleep headband. This headband can serve either as an earmuff or as both that and a sleep mask. CozyPhones is, in reality, not a product able to cancel an incredible amount of noise. However, on the upside, it is very comfortable and practical. It’s not too conspicuous, either, which makes it easier to use in public. Besides, it’s very lightweight, so it’s very easy to forget that you have it on you. You can use this product in a number of different ways in order to relax: you could do yoga, meditate, listen to an e-book, etc. However, it can also be extremely helpful as a sleeping aid. The average user will appreciate using this as a lightweight and somewhat flexible earmuff. What’s great about it is that it allows a lot of air to come through, so your skin can continue to breathe as you sleep. Therefore, wearing CozyPhones for a long period of time will not cause your skin to overheat. However, there is a downside to this product which may affect some users. I didn’t find it very adjustable in terms of size. That is why some users may experience discomfort with CozyPhones. So, Are These Earmuffs Worth It? I hope I managed to cover all the essential questions related to buying earmuffs for sleeping in this guide. As I already mentioned, earmuffs are a much better alternative than earbuds, in my book. The reason why I think so is mainly because earbuds feel very uncomfortable after prolonged periods of use. They may even end up hurting your ear canal. Although they do shut off the noise pretty effectively by tightly sealing up your ears, they are hardly the most practical solution for long-term use. Earmuffs, on the other hand, feel much more comfortable. They are large enough to be difficult to lose, while still small enough to be portable. With all the different types and models we’ve listed so far, it’s clear that there is a lot to choose from. Some users may opt for earmuffs used exclusively in bed, while others may choose a model with multiple functions. It’s important to note that even those earmuff brands which do not provide an insane level of noise cancellation are still useful to an average user. Perhaps that would not be the case with the earmuffs you use for e.g. firearms practice, which need to completely eliminate the noise. However, earmuffs for sleeping only need to muffle the sounds enough to give you some peace and quiet. It may even be desirable to remain able to hear to a certain degree, so you can react quickly in the case of an emergency. Did you find this guide helpful? Remember that buying soundproof earmuffs for can greatly improve your quality of sleeping and living in a very simple way. In my opinion, it’s definitely worth a shot for anyone who is bothered by noise at night. Try out a pair as soon as possible, and you will know exactly what I’m talking about!